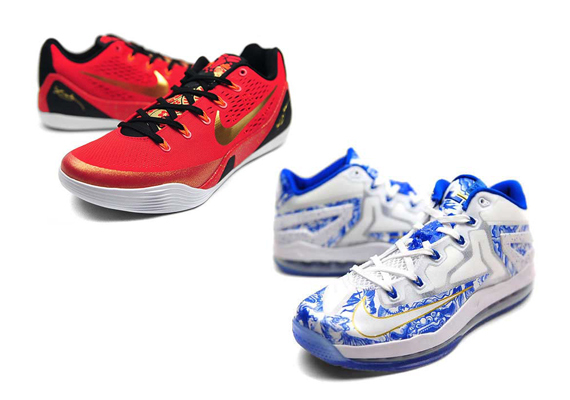 The Nike Kobe 9 EM “China” and Nike LeBron 11 Low “China” each release tomorrow, August 30th, 2014. While each shoe is releasing near the end of their respective runs with the likes of the LeBron 12 on the way and the Kobe flyknit low-tops garnering more attention than the respective engineered mesh counterparts, these special edition China-inspired colorways still manage to demand your attention. Where as the Kobe 9 EM gets the metallic gold swoosh treatment and a festive red, the LeBron pair veers off any matching path for a look inspired by the Asian country’s handmade porcelain vases in a cool shade of blue. Check out more images of these China themed LeBron and Kobe pairs and let us know which pair you’re vying for in the comments section.